List honors leaders expected to have the biggest impact on regional economy and corporate community. 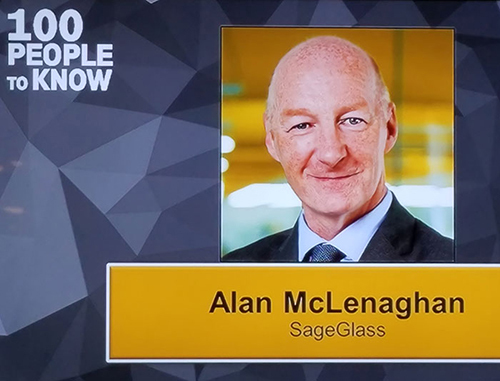 Alan McLenaghan, CEO of SageGlass, manufacturer of the world’s smartest electrochromic glass, was named to Twin Cities Business’ (TCB) 100 People to Know in 2018 List at an awards ceremony held on Dec. 14. This list, formed by TCB’s editors and correspondents, recognizes the leaders expected to have a significant impact on the Minneapolis region’s economy and corporate community in the coming year. After choosing the top 100, TCB groups these leaders into categories to create a “Who’s Who” of Minnesota business and public policy so the region is aware of the influencers, thought leaders and key players projected to drive change in 2018. Alan was named to the “Titans” category because of his industry-recognized leadership skills as well as the positive transformation he has created as CEO of SageGlass. Under Alan’s leadership, SageGlass’ headcount has grown from 150 in 2013 to approximately 230 employees, and the company has expanded into additional countries overseas including Denmark, Norway and Sweden. Other 2018 “Titans” include leaders like Inge Thulin, CEO of 3M, and Jim Hovland, Mayor of City of Edina. For more information about the TCB’s 100 People to Know honorees, please visit: http://bit.ly/2B0US9h .